Self-Drilling Screws | Labour & Material Saving | ASP Ltd.
Drills hole, forms mating thread and clamps home in one easy operation. No more need for difficult alignment of two or more elements. Eliminates power drills, drill bits and elaborate and costly press tools, machine taps and their maintenance. Only one tool required – the screw driver. Ensures correct hole size every time, resulting in better thread engagement and tighter clamp. 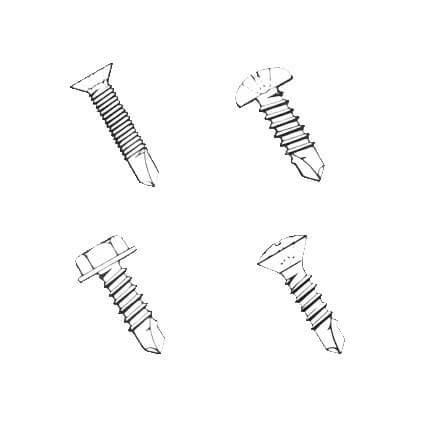 With self-drilling screws, drilling and tapping operations do not occur simultaneously. The drilling operation must be completed and the tip of the drill point must have fully penetrated though the material before thread engagement begins, or stallout will result. Therefore it is imperative that the flute length be equal or greater than the total thickness of the material(s) plus air space to be penetrated.